The most commonly used op-amp is IC741. The 741 op-amp is a voltage amplifier, it inverts the input voltage at the output, can be found almost everywhere in electronic circuits. It is a 8-pin dual-in-line package with a pinout shown above. Pin 2: Inverting input terminal. Pin 3: Non-inverting input terminal. 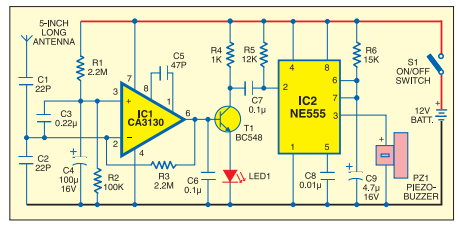 Pin 4: –VCC (negative voltage supply). Pin 7: +VCC (positive voltage supply). The main pins in the 741 op-amp are pin2, pin3 and pin6. In inverting amplifier, a positive voltage is applied to pin2 of the op-amp; we get output as negative voltage through pin 6. The polarity has been inverted. In a non-inverting amplifier, a positive voltage is applied to pin3 of the op-amp; we get output as positive voltage through pin 6. Polarity remains the same in non-inverting amplifier. 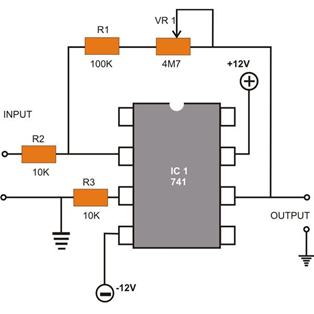 Vcc is usually in the range from 12 to 15 volts. When two supplies (+Vcc/-Vcc) are used, they are the same voltage and of opposite sign in almost all cases. Remember that the operational amplifier is a high gain, differential voltage amplifier. For a 741 operational amplifier, the gain is at least 100,000 and can be more than a million (1,000,000). That’s an important fact you’ll need to remember as you put the 741 into a circuit. 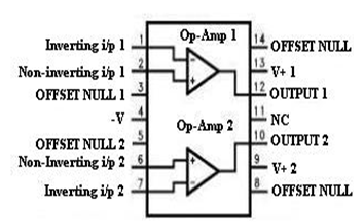 There are many common application circuits using IC741 op-amp, they are adder, comparator, subtractor, integrator, differentiator and voltage follower. 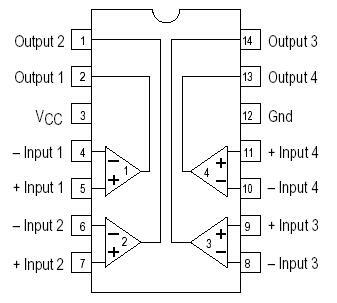 Below is some example of 741 IC based circuits. However, the 741 is used as a comparator and not an amplifier. The difference between the two is small but significant. Even if used as a comparator the 741 still detects weak signals so that they can be recognized more easily. 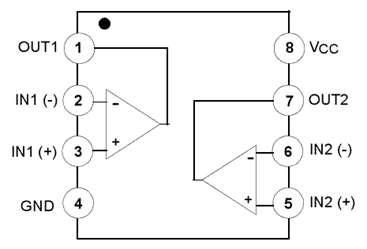 A comparator is a circuit that compares two input voltages. One voltage is called the reference voltage and the other is called the input voltage. It is a circuit which compares a signal voltage applied at one input of an op-amp with a known reference voltage at the other input. The 741 op-amp has ideal transfer characteristics (output ±Vsat); and the output is changed by increment in the input voltage of 2mV. 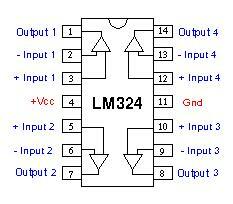 LM324 is a quad op amp integrated circuit with high stability, bandwidth which was designed to operate from a single power supply over a wide range of voltages. They have some dissimilar advantages over standard operational amplifier types in single supply applications. It is a 14-pin dual in-line package, contains four internally compensated and two stage operational amplifiers, shown in figure. Potential dividers of LM323 are connected to the inverting and non inverting inputs of the op-amp to give some voltage at these terminals. Supply voltage is given to +V and –V is connected to ground. The output of this comparator will be logic high if the non-inverting terminal input is greater than the inverting terminal input of the comparator. When the inverting input is more than the non-inverting then logic low (0) will be the output. When the power is applied to non-inverting terminal which is less than the inverting voltage of op-amp then the output becomes zero which means there is no current flow. Because we already know that when “+ > – = 1”. Here the ‘+ ‘sign indicates non-inverting terminal and ‘-‘sign indicates the inverting terminal. If the non-inverting voltage is greater than the inverting voltage then the output will be high. In this output of LM324 is internally connected to some resistance and it has some arrangement inside the IC, which makes a lot of difference to other comparators. It is internally pulled-up, so no need of any resistor connection from the supply. The LM339 is a most commonly used comparator, designed for use in level detection, low−level sensing and memory applications in automotive and industrial electronic applications. It has four inbuilt comparators; it compares two input voltage levels and gives digital output to show the bigger one. These comparators additionally have a unique characteristic in that the input common-mode voltage range includes ground, in spite of the fact that they are operated from a single power supply voltage. Potential dividers of LM339 are connected to the inverting and non-inverting inputs of the op-amp to give some voltage at these terminals. Supply voltage is given to +V and –V is connected to ground. The output of this comparator will be logic high if the non-inverting terminal input is greater than the inverting terminal input of the comparator. If the non-inverting voltage is greater than the inverting voltage then the current flow will be in the device. The LM339 is act as an open-collector that’s why we connected the resister from the supply, if we remove the resister then there is no current flow in the circuit. The LM358 op-amps are used in transducer amplifiers, dc gain blocks and all the conventional op-amp circuits which now can be more easily implemented in single power supply systems. For example, the LM358 op-amp can be directly operated off of the standard +5V power supply voltage which is used as a part of digital systems and will easily provide the required interface electronics without needing the extra ±15V power supplies. It comes in an 8-pin DIP package is shown in below. 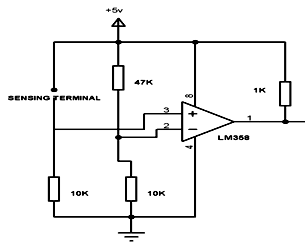 The inverting input of the comparator LM358 i.e., pin 2 is given to the fixed voltage i.e., in the ratio 47k:10k and the non inverting input of the comparator is pulled down and is given to sensing terminal. When the resistance between the positive supply and the non inverting input is high then resulting is the non-inverting input less than the inverting input making comparator output as logic low at pin1. And when the resistance falls making available a voltage to the non-inverting input higher than inverting input, so that the output of comparator is logic high. It is excellent Op Amp that requires very low input current requirements. Its output will be in the zero state in the off mode. CA3130 is the 15MHz BiMOS IC with MOSFET inputs and a bipolar output. MOSFET transistors are present in the inputs that provide very high input impedance. The input current can be as low as 10pA. The IC shows very high speed of performance and combines the advantage of both CMOS and bipolar transistors. The presence of PMOS transistors at the inputs results in common mode input voltage capacity down to 0.5 volts below the negative rail. So it is ideal in single supply applications. The output has CMOS transistor pair that swings the output voltage within 10mV of either supply voltage terminal. 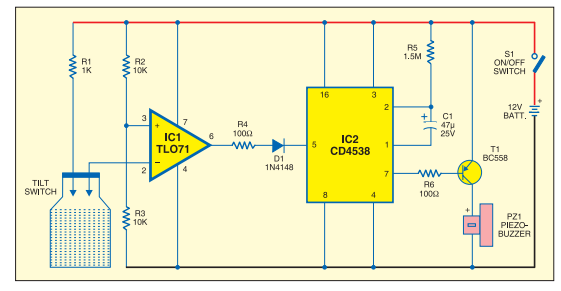 IC CA3130 works off 5 to 16 volts and can be phase compensated with a single external capacitor. It also has terminals to adjust the offset voltage and strobing. It is the 4.5MHz BiMOS Op Amp with MOSFET inputs and bipolar output. It has both PMOS transistors and high voltage bipolar transistors inside. Is inputs have gate protected MOSFETs (PMOS) that provides very high input impedance typically around 1.5T Ohms. The input current requirement is very low around 10pA. It exhibits very fast response and high speed of performance. The output has protection against damage from load terminal shorting. The input stage has PMOS FET which helps in common mode input voltage capability as low as 0.5 volts. The IC is internally phase compensated for stable operation. It also has terminals for additional frequency roll off and offset nulling. It is a low noise Op Amp with JFET inputs. It operates in wide common mode and consumes very little current. It requires very low input bias and offset currents. It’s output is short circuit protected and has very high slew rate of 13 V/us and exhibits latch free working.TL0 71 is ideal for high fidelity and audio preamplifier circuits. TL071 and TL0 72 contain only one Op Amp inside while TL074 is a Quad OpAmp with 4 operational amplifiers inside. It is a dual OpAmp with separate inputs and outputs. It has JFET inputs and bipolar outputs. The IC shows very high slew rate, low input bias. It also has low offset current and low offset voltage. Its inputs can be biased with very low input currents. Output of the IC is short circuit protected. TL082 exhibits latch free operation and it has the internal frequency compensation. 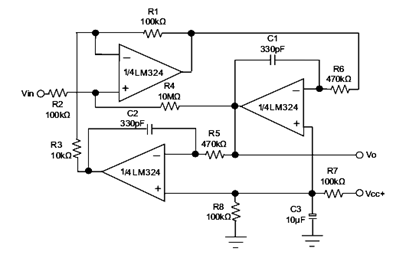 It is a single OPAMP capable of driving DTL, RTL, TTL or MOS circuits. Its output can switch up to 50 volts and 50mA current. It works on wide range of supply voltages from 5 to 30 volts and requires only single supply. It can directly drive relays, solenoids etc if the current requirement is less than 50mA.The pin connection of LM311 is different from other OpAmps. Here the pin3 is inverting input and pin2 Non inverting input. Output also is different. It has two outputs. Pin7 is the Positive output that sinks current while Pin 1 is the negative output. Pin 7 is connected to the collector of the NPN output transistor. Pin1 forms the emitter of output transistor. Normally the output transistor is in the off state and its collector will be pulled to Vcc. If its base gets more than 0.7 volts, it saturates and turns on. This sinks current and the load turns on. So unlike other OpAmps, LM311 sinks current and output turns low when triggered. How to test an Op Amp IC? Operational Amplifiers are widely used in electronic circuits as amplifiers, comparators, voltage follower, summing amplifier etc. Most of the commonly used Op Amps like 741, TL071, CA3130, CA3140 etc have same pin configurations. Hence this tester is useful to check the working of the Op Amp during trouble shooting or servicing. It is an easy to make tool which is essential in the work bench of a hobbyist or technician. The tester is wired around an 8 pin IC base into which the IC to be tested can be inserted. Pin 2 (inverting input of IC) is connected to a potential divider R2, R3 that gives half supply voltage to pin 2. Pin 3 (None inverting input) of IC base is connected to the VCC through R1 and a Push to on switch. Output pin 6 is used to connect the visual indicator LED via the current limiting resistor R4. The design is a voltage comparator. Insert the IC in to the socket with correct orientation. The notch at the left side of the IC should match with the notch in the IC base. In this comparator mode, the output of IC1 goes high when its pin 3 gets a higher voltage than pin 2. Here pin 2 gets 4.5 volts (if battery is 9V) and pin 3, 0 volts. So the output remains low and LED will be dark. 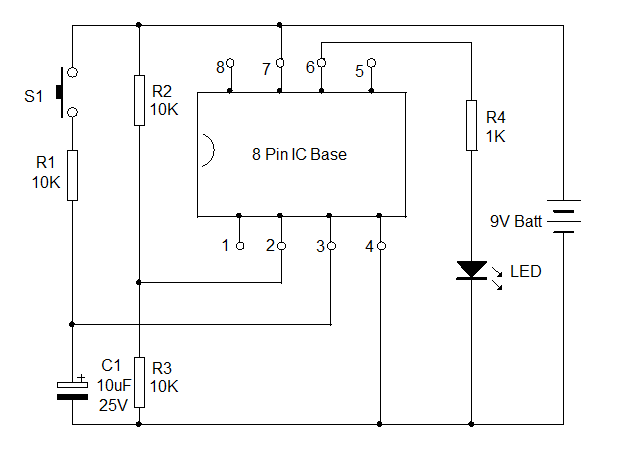 When S1 is pressed, pin 3 gets higher voltage than pin 2 and the output of IC turns high to light the LED. This indicates that the circuitry inside the IC is working. Now you have got an idea about the pin configuration and opam IC’s if any queries on this topic or on the electrical and electronic projects leave the comments below.